Natural GMO? Sweet Potato Genetically Modified 8,000 Years Ago : Goats and Soda People have been farming — and eating — a GMO for thousands of years without knowing it. Scientists have found genes from bacteria in sweet potatoes around the world. So who made the GMO? 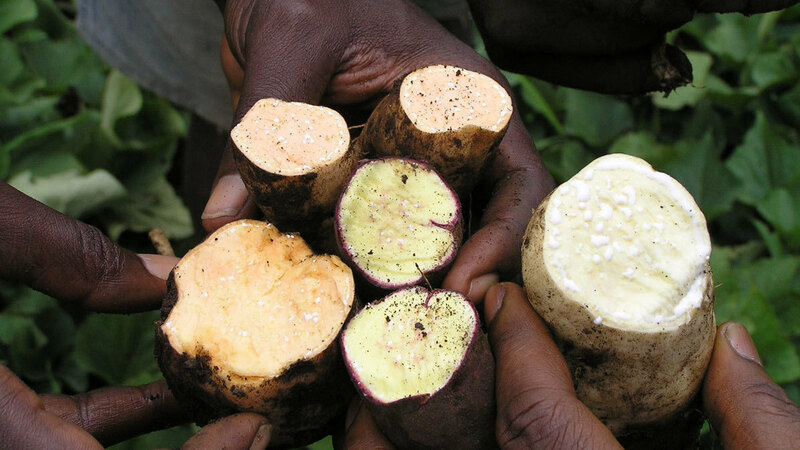 Now that's a big root: Sweet potatoes aren't tubers, or thickened stems, like potatoes. Sweet potatoes are roots — swollen and packed with starch. The first genetically modified crop wasn't made by a megacorporation. Or a college scientist trying to design a more durable tomato. Nope. Nature did it — at least 8,000 years ago. Well, actually bacteria in the soil were the engineers. And the microbe's handiwork is present in sweet potatoes all around the world today. Scientists at the International Potato Center in Lima, Peru, have found genes from bacteria in 291 sweet potato varieties, including ones grown in the U.S., Indonesia, China, parts of South America and Africa. The findings suggest bacteria inserted the genes into the crop's wild ancestor, long before humans started cooking up sweet potato fries. "People have been eating a GMO for thousands of years without knowing it," says virologist Jan Kreuze, who led the study. He and his colleagues reported their findings last month in the Proceedings of the National Academy of Sciences. A sweet rainbow: Americans like their sweet potatoes orange and packed with sugar. But in Africa, yellow and white varieties are also popular. They tend to be less sweet. Kreuze thinks the extra DNA helped with the domestication of the sugary vegetable in Central or South America. Sweet potatoes aren't tubers, like potatoes. They're roots — swollen, puffed-up parts of the root. "We think the bacteria genes help the plant produce two hormones that change the root and make it something edible," Kreuze tells Goats and Soda. "We need to prove that, but right now, we can't find any sweet potatoes without these genes." When our ancestors started to farm sweet potatoes, Krezue says, they very likely noticed the puffed up root and selected plants that carried the foreign genes. The genes stuck around as the sweet potato spread across the globe — first to Polynesia and Southeast Asia, then to Europe and Africa. Today, the sweet potato is the world's seventh most important crop, in terms of pounds of food produced, the Food and Agriculture Organization of the United Nations says. "In the U.S., it seems to be important only at Thanksgiving," Kreuze jokes. "But in parts of Africa, it's a staple crop. It's very robust. When every other crop fails, sweet potatoes still grow." 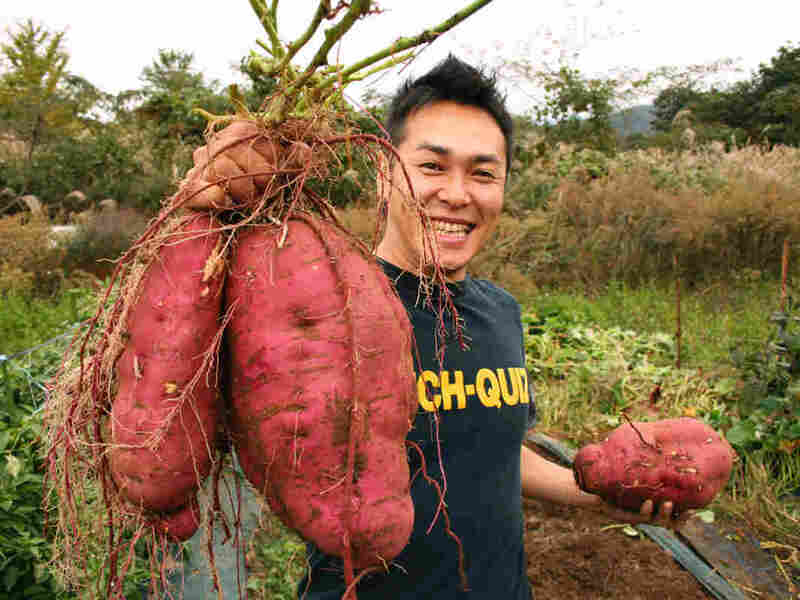 In China, sweet potatoes are used to feed livestock. And in many other places, people saute the plant's leaves to make a yummy dish called sweet potato greens. All these farmers — whether they're tending to backyard plots in Rwanda or megafarms in China — are raising a natural GMO. "I don't think that's all that surprising," says Greg Jaffe, the GMO expert at the Center for Science in the Public Interest in Washington. "Anyone who's familiar with genetic engineering wouldn't be surprised that the [bacteria] Agrobacterium inserted some DNA into some crops." Making GM plants is surprisingly easy. * Scientists take a few plant cells and mix them with a special bacterium, called Agrobacterium. The microbe acts a bit like a virus: It injects a little chunk of DNA into the plant cells — which eventually finds its way to the plant's genome. Agrobacterium is ubiquitous in soils all around the world — and infects more than 140 plants species. So it doesn't take much imagination to see how the bacteria's DNA could eventually find its way into our food. "I suspect if you look in more crops, you'd find other examples," Jaffe says. So why does an 8,000-year-old GM sweet potato matter? The example might be helpful for regulators and scientists looking at the safety of GM crops, Jaffe says. "In many African countries, some regulators and scientists are skeptical and have some concerns about whether these crops are safe," Jaffe says. "This study will probably give them some comfort. It puts this technology into context." But the study won't assuage many consumers' worries about GMOs, Jaffe says. "A lot people's concerns aren't just about whether what the scientists have done is natural or whether the crops are safe to eat." Many people worry about whether GMOs increase the use of pesticides and herbicides. Or that some companies use the technology to make seeds intellectual property. "In these instance, you have to look at the GMO on a case-by-case basis," Jaffe says. In the case of sweet potatoes, at least, the world seems clear on all those fronts. *There are several other ways to make GM plants. For example, another method uses a gun to shoot DNA-coated gold particles into plant cells.